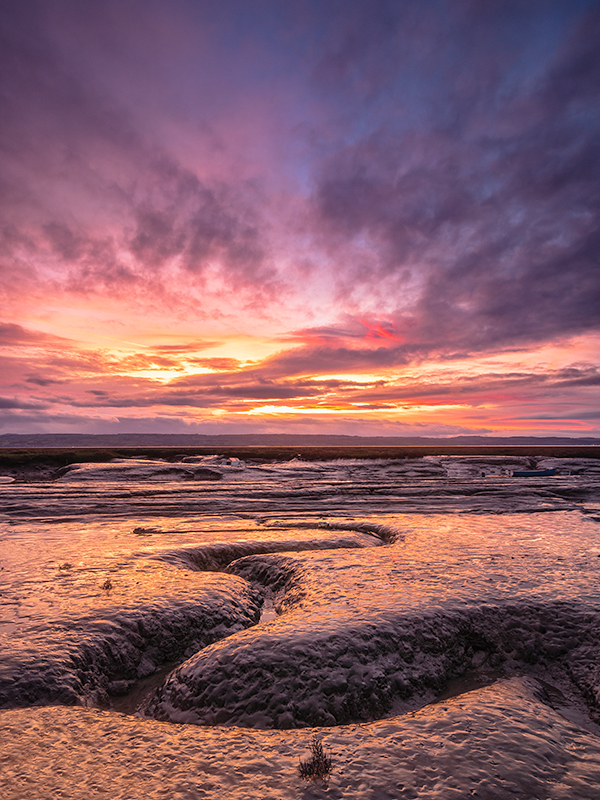 Sunset on the mud flats. ND Graduated filters are a must for shots such as this. I want to share with you a valuable lesson about filters. Those of you reading this blog regularly will no doubt be aware of the importance I place on the use of filters, particularly ND Graduated filters, for Landscape Photography. For some time I have wanted to try out the reverse ND graduated filters that have started to become so popular recently. These are just like the normal ND graduates except that they are slightly lighter at the top part of the filter. This means there is a darker band running across the centre of the filter. The idea is that you place the darker band on the horizon where it is typically lighter at sunrise and sunset. This helps prevent the rest of the sky becoming unnaturally dark. The problem with these filters is that they are unusually expensive. To buy a set of 100mm filters you need to take out a second mortgage and I can’t help but feel that I’m being ripped off. The P series are a little better but still cost upwards of £60 each. My solution has been to switch to using A Series filters. I can do this as I use micro 43 and compact cameras (forget the recently acquired RX10 for the moment). To give you the complete story a friend had been thinking about the same thing and made the purchase first. I tested the filters on my lenses and all worked perfectly with no vignette so I was happy to make a purchase. The filters I bought were the HiTech 67mm which are the same size as the Cokin A Series and are the same as my friends. He was using his with the Cokin A series filter rings and holder but I thought that I would buy the HiTech versions. This was more costly but I liked the modular holder and it would allow me to attach a 77mm polarising filter with a separate adapter. All is fine with the filters and the holder is great. It was at this point that I decided to purchase a cheap Cokin holder as a spare. Well, the damn thing won’t fit on the HiTech filter rings. They are too thick and slightly too wide a diameter. I checked this again by trying to use a Cokin A Series filter ring with the HiTech holder. That doesn’t work either as the Cokin ring is too small. So, this lesson didn’t cost me very much (about £10) but I thought it would be worth sharing. The A Series filters from HiTech are much more affordable as well so my loss is more than compensated. The same goes for the Hitech 85mm series rings, by the way. They are thicker than the Cokin P ones and don’t fit properly in the other manufacturer’s holder. I have both the Hitech and Cokin P holders and it’s annoying that the adapter rings aren’t interchangeable. In the end I stuck with the Cokin holder because it was lighter, and the cheap Cokin slot-in polariser seems to do the job OK. Thanks Ed, I wasn’t aware of that. I’m using Cokin P rings with a HiTech P sized holder. The holder locks on nicely. I guess it’s if you try the HiTech rings with the Cokin filter there is a problem.